YOU’RE stood at the side of the track. It’s quiet other than the rustle of the wind in the grass. The people around you have all fallen silent in anticipation. Away to your right you hear the familiar drone of a Ducati engine. And it’s being worked. Hard. You look up the track, but there’s nothing to see. The noise gets louder and then John Reynolds’ Red Bull British superbike appears on the horizon. For a time it hardly seems to be moving, then suddenly it begins to grow. Seconds later it has flown past at incredible speed and is fast disappearing into the distance. As is rider Niall Mackenzie, in his orange INS leathers. Then the activity starts. Everybody’s calling out " what was that? " and there’s an air of disappointment at the reply: " Just 195mph " . How can you be disappointed with that speed from a production-based V-twin? Because the team geared the bike for 200mph, and they are determined to see it. The Red Bull boys are among five teams who have gathered at Bruntingthorpe Proving Ground to let triple British champion Mackenzie put their bikes through their flat-out paces. All the machines are very different. There’s Reynolds’ 996, David Jefferies’ 02+ Yamaha R1, Jim Moodie’s V&M R6, Callum Ramsay’s Yamaha TZM250 and Kenny Tibble’s Honda RS125. Apart from the big Duke, all helped their riders to respective titles in the British Superstock, Supersport, 250 and 125 championships. They’re all among the fastest of their ilk in the country. And we’ve brought them to this desolate, deserted runway to see what they can all do. The weather’s bitterly cold and there’s a bit of a tail wind. That’s all good for speed – the cold, dry air will provide a better burn in the engine and the wind will help push the bikes along. If there’s anywhere you’re going to get maximum speed it’s here, today. We plan to measure their top speed and standing quarter-mile times. Mackenzie has the task of chief tester and he will be helped by ex-racer Nigel Bosworth. Mackenzie, who retired from racing this year after a glittering career in GPs and superbikes, shouldn’t need any introduction to race fans. Bosworth has pretty good credentials, too, being a former 250 star who’ll be remembered by many for his tears at Brands in ’93 when he missed out on the British title after his crank failed in the final round. He is a test rider for Kenny Roberts’ Modenas 500 GP team, so he’s used to going fast and doing the same thing over and over again. That’ll be handy, then. After a couple of practice runs on the Ducati, to familiarise themselves with Brunter’s entertaining over-banding, Tibble’s team wheels out his tiny racer for the first official speed runs of the day. It’s fair to say that neither man is looking forward to riding the bike. Bosworth suggests 10 years is a conservative estimate as to how long it has been since he’d last straddled a 125. When he slings his leg over Tibble is less charitable. " It’s gotta be a lot more than 10 years, " he says. Meanwhile, Mackenzie is able to put a very accurate figure on the length of time since he rode one. Er, since birth. " I’ve never ridden one and I’ve never wanted to, " he says with a grimace as he towers over the minute machine. The Honda is like a minimoto next to the 996. It weighs in at 72kg (158lb) and even Ramsay’s 250 dwarfs it. To get the most out of the engine’s 42bhp, Tibble has stuck the smallest rear sprocket on the bike that he could find. It’s still wrapped up and he says: " God knows how long I’ve had this. It’s been in the workbox for ages and I didn’t think it would ever get used. There isn’t a track in the country where you’d need this. " He then gave both riders a thorough briefing about the bike while his dad considered the cold air and altered the main jets in the carb to suit. It wasn’t that he was precious about the thing, just that both riders were worried about getting moving without looking foolish. Even so, both bogged the engine as they pulled away, forcing them to whip the clutch in and administer a large dose of revs and clutch slip. Once they got the feel of it you could hear them clutch slipping into the distance, still in first gear. Bosworth is first out and comes back with some pretty strong views. He said: " The bike is like a lightswitch around 10,000rpm. Drop below it and you fall into a gaping hole of a flat spot. The launch was a nightmare on the top speed gearing. There were no problems with the clutch, which was lucky as you had to use it all the time. You have to work hard to keep the engine on song. Fall below 10,000 revs and you have to play tunes with the clutch to get any drive. " Mackenzie agreed after he returned from his first lap. " The launch took for ever and the bike felt like it needed a tow, " he said. " The acceleration is a bit steady and 12-13,000rpm is the only usable area. " Both riders felt the gearing was a little over the top – Mackenzie only managed to use five of the six gears. As you’d expect from such a small motor, each rider felt as if they were travelling at walking pace down the two-mile straight – but it was a different story around the bends. Mackenzie and Bosworth both complemented the handling, describing it as " a proper race bike " . Mackenzie said: " The corners were much more enjoyable than I thought. It’s tiny and you have to rev it flat-out all the time, but it’s a fantastic first race bike. It’s stable in corners and goes where you want. " Bosworth told a similar story. " The stability is perfect – just put it where you want it. It’s a fantastic package, but you have to work very hard to get the best out of it. " For the quarter-mile sprints it was just a matter of changing sprockets. We’d thought it would need some attention to its minimalist, lightweight clutch, but Tibble said not. " It’ll stand plenty of abuse, " he said. " If it doesn’t we can rebuild it, no problem. " With the revs painfully high, clutch-slip leaves the smell of lightly flambéd clutch plate in the air and the tiny missile shoots forward with surprising speed. Mackenzie is finally triumphant, getting the 125 down the quarter in just 12.71s, bettering Bosworth by four tenths. Both have the same terminal speed. Their comments are surprisingly favourable. Bosworth says: " That was easy! Get it buzzing, dump the clutch and off you go! Acceleration is nothing breathtaking, you’ve just got to keep it lit. " Mackenzie added: " After the top speed run the acceleration was quite impressive, but you have to keep it on maximum revs until first gear is finished with. After that just change gear about every three seconds up to sixth. " Its top speed was eventually logged as 136mph on the dot. The 125 took everybody by surprise. The riders didn’t expect to enjoy it. We didn’t think it would stay the course. But it did. After getting a feel for the track, the wind and the sensation of nailing a bike to the stop for minutes at a time, our dynamic duo had something more familiar to try next – Moodie’s R6. As well as the Supersport title, this is the bike that won the Junior TT. V&M’s Steve Mellor said: " We’ve used the same gearing as we used on the Island, so it should be alright. " Mackenzie is out first, and screams through the lights at 173mph. Not bad, but the V&M team is disappointed. A second and third run produces 174mph. It’s clear there is no more to come, as the bike was hitting the limiter in sixth – at 15,600rpm. Mackenzie is moved by his experience. " That sounds awesome! " he says through a big grin. " The bike is fantastic fun – it’s the best production-based bike I’ve ever ridden. It’s 100 per cent stable, the engine feels good at peak revs, between 14,500 and 15,000 revs, and the power is very usable elsewhere. " Any criticisms, Niall? " The acceleration didn’t feel that strong, but it was probably just because the rev range is so wide. The gearing felt just about perfect, but it could probably carry another tooth or half a tooth. " Mellor took the advice, and off came the TT configuration and on went the North-West 200 set-up with another two teeth off the rear sprocket. Then Bosworth went out. Any fears the bike will not pull the extra speed are quickly squashed as Bosworth goes through at 178mph and follows it with an identical speed. Then it’s only fair to let Mackenzie have another go on the new gearing. He does the same. 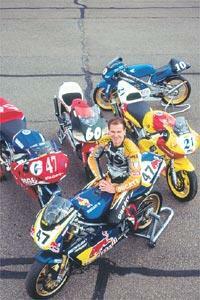 Bosworth is equally taken by the Yamaha. He said: " The clutch is a text-book example – there’s great feel which is perfect. The acceleration is long and progressive and it pulls hard all the time, despite the wide rev band. " another try before the team changes the gearing for the quarter-mile run. Buried under the screen he goes through the lights at 179mph. We pray the error might be in our favour. The Pi datalogger says it is. His speed is actually 180.9mph. Mellor is triumphant. " I was sure it could pull the gearing for 180, but at that speed you’re getting into aerodynamics rather than power, so Bosworth was going to be the man as he tucks in so well. Good work! " Good work indeed. But there’s no time to celebrate. Fingers are getting dirty once more, changing the gearing for the quarter-mile run. Bigger sprockets go in and Mackenzie lines up. He is revving hard, but not hard enough. After his first attempt he said: " I always forget to rev this bike hard. At 13,000rpm it sounds and feels like it’s at maximum revs, but 15,000 is where you want to change gear. " A second launch scrapes 0.2s off his time and adds 4mph to the terminal speed. This time he’s got it about right, but the high revs are still giving him problems. He said: " It feels heavy to get going as all the power is at the top end. The clutch is smooth and there’s reasonable feel for this sort of start. If you get the revs right the acceleration is very progressive. " Bosworth takes three attempts to better the Scot’s time, finally shaving off 0.07s. His opinion of the bike is similar. " You’ve got to use all the revs to make it work properly, but when you do it really does work. With this gearing the bike’s even easier to launch and the clutch is fine. With the engine revving flat-out it just pulls all the way to the line. There’s no hint of fade at these speeds. " Both riders come away well impressed by the R6, but better is still to come in the form of the third-placed machine in this year’s British superbike championship. The Red Bull Ducati was always going to create the most interest. It’s the only one that stands a chance of breaking the 200mph barrier, and it’s the closest thing to a factory race bike here today. Having raced it at the Hockenheim WSB round earlier this year, the team had some idea of what it was going to take to crack 200mph. They brought it to Brunters geared two teeth lower than they’d run in Germany, and that gave it a theoretical top speed of 207mph. Could it make it? There was only one way to find out. After riding the INS 996 all year, Mackenzie knows a thing or two about the big twin, so we send Bosworth out first to set the benchmark. After settling himself in he disappears down the track to complete a loop of the perimeter before getting to the start of the straight. As the bike rumbles out of view, the team’s mechanics strain to follow the sound. The far side of the runway is two miles away, yet you can still hear the twin pipes bellowing their intentions. As the bike appears at the end of the straight we all marvel at how small Bosworth manages to make himself. Aerody-namics play a crucial part at this speed, and our man clocks 195mph. He does a second run and jumps up to 196mph. Bosworth cruises back to the pits. Mechanic Chris Anderson and chief technician Steve Thompson plug in the laptop and download the information while Bosworth gives his thoughts on the bike. Interestingly, one of his first comments confirms the problem Reynolds had at Hockenheim. " It’s not that stable when you really get going, " he says. Get going? What sort of speed? " It starts to twitch its head at about 155-160mph. Obviously I’m guessing a bit about the speed because there isn’t a speedo, but I reckon that’s about right. " But you went on to 196mph. At that point the team confirms that he was only in fifth gear – there’s a whole gear left unused as he’s been hanging on to the revs too long. The best time to change is at 11,500, but Bosworth has been running to the limiter another 1000 revs on. While Bosworth is giving his thoughts, Mackenzie gets ready to go and the mechanics impress on him the need to shift earlier. Seeing him get on the metallic blue Red Bull bike in his orange leathers is an odd sight. You want to dash over and tell him he’s on the wrong machine. But before you can he’s gone, howling away as if he’s going to set a higher speed without a run-up. Soon we hear Mackenzie swing round on to the straight. Because of a slight crest in the runway, we can’t see him, but even if we could he’d be a microscopic dot on the horizon. He’s changing earlier and the mechanics count the changes. They know he’s hit sixth as he flies by. Visually, it’s impossible to tell whether he’s faster or slower, so we look to the timing gear. Incredibly, he’s 8mph down on Bosworth at " only " 187mph. His second run sees him improve to 190mph, but that’s it. He cruises back to the pits and the mechanics decide to change the gearing, back to Hockenheim settings. Four more runs see the same pattern repeated. Mackenzie clocks 191mph. Bosworth does the same, but misses a gearshift, then he gets it right and hits 197mph. There’s a slight difference of opinion between the riders after this. Mackenzie says the power tails off after 11,700rpm and is especially strong around 10,500. He doesn’t like the quickshifter as it lacks feel and, though he knows the bike is fast, he feels the torque disguises it. Bosworth loves the quickshifter, doesn’t note any highs or lows in the power and thinks the gearing is spot-on, while Mackenzie feels it’s too high. Both note the front end instability, but Bosworth thinks it’s worse than Mackenzie does. We want to do more, but time is against us and we have the standing quarters still to do. The bike is up on the stands and the chain is whipped off so the sprockets can be changed. A new chain is also fitted. Not because it’s worn, but because a longer chain is needed for the bigger sprockets. Mackenzie goes first and his run turns into a tyre-warming session. The wind has cooled the rubber and when he tries to get a fast launch he gets wheelspin instead. It entertains the rest of us, but he sets a time of 11.65s with a terminal speed of 136mph. We ask him if he wants to do a lap to get some heat in the tyres. " No thanks, " he says, " I don’t think they need it now! " A second start sees things go more smoothly and he drops his time to 10.36s at 150mph. He’s impressed with the bike – he expected the clutch to start playing up, but it’s still smooth. He says: " It’s easy to spin the rear, but that ruins your time as I proved! It’s impossible to keep the front wheel down in first gear so you just have to try and control it until you hit second. " Bosworth finds it much the same, despite giving the clutch its third and fourth hard starts. He says: " The clutch is very light, it feels nice and it’s easy to control. It pulls like a train all the way. " His final run of the session saw him clock an impressive time of 9.65s at a terminal speed of 157.50mph. Nice. Due to the short life of some of the other bikes in the test, we’ve got time on our hands and we decide to try again for the magic 200mph. Mackenzie goes off for two laps, but he still can’t break it, his wider elbows possibly enough to hold his speed down to 195mph. Bosworth tries to go better by holding himself off the seat to improve the air-flow, but he misses a gear. He’s disappointed and, despite running low on fuel which means he may not even make it around the track, he carries on for another run. As he makes the final charge down the straight we’re praying the bike won’t start spluttering as the tank runs dry. It doesn’t. He howls past, not even looking where he’s going. His face is pressed down into the tank, elbows into his knees. The timing lights say 197mph, but there are no decimals. There is an error on the lights according to Robin Hutton, who has used them for more speed testing at Brunters than he cares to remember. We wait anxiously for the bike to return. What will the datalogger say? Incredibly, it flashes up 200.62 mph. The mechanics heave a satisfied sigh and say: " That’ll do! " Indeed it will. For a long time we’ve spoken of superbikes capable of over 190mph. Now we can legitimately claim they’ll do 200mph. But only if you really work at it. As last week’s group test of the superbikes with Aaron Slight showed, the Ducatis have really had the power advantage in British superbikes this year. They also have the top-end legs, it seems. If you were paying attention at the beginning, you will remember I said there were five bikes being tested – and so far I haven’t mentioned the R1 or TZM250. A season’s racing is pretty brutal on a bike, no matter how pampered and loved it is, and these two machines sadly decided they’d had one lap too many. Mackenzie came to the test as both rider and owner of Ramsay’s 250. The bike had already been sold and the buyer was turning up on the day to put the wad of cash in Mackenzie’s iron grip. For that reason, Niall asked if we could run his bike first and get it out of the way. Mackenzie volunteered to take it out. He knows a thing or two about racing 250s, having won the British championship twice and competed in GPs. But even his vast experience couldn’t save it. The first pass gave an impressive 156mph through the lights. The second run was even better at 158mph. But as he cruised back to the pits things were wrong. He shut the bike down and rolled in. And, despite a stripdown, it wasn’t going to start again. Not a blown head or a holed piston as we’d feared, but a gearbox problem. Everyone rallied around, offering tools, spares and opinions, but when the cases came off it was clear none of it would help. The tiniest of parts had broken, a small post that makes the gear selection return spring come back. Without it, there was no way to change gear and with heavy hearts it was loaded into its new owner’s van. Still, we took comfort in the fact it was Mackenzie on board his own bike at the time it failed. He said: " First gear is very high, which made it hard to launch. The clutch lever is so light it feels like there isn’t a clutch there. The engine is flat below 10,000rpm, but very strong from about 11,000 to 13,500. It felt slightly over-geared and might have gone better with a lower gearing. It is stable everywhere and the riding position is comfortable. This is a proper race bike and changing direction and stopping are awesome. " High praise indeed for a bike he had already sold. Unfortunately for the Scot, he was also riding the second bike of the morning to pack up – Jefferies’ 02+ Yamaha R1. The British Superstock title winner was expected to turn big numbers through the lights. A stock R1 clocked 175mph at the same venue earlier this year, so we were looking for something well into the 180s. With a pipe and the general engine " tidying " allowed under the Superstock rules, power is up and therefore speed should be, too. Imagine our disappointment when it managed just 170mph dead. Literally. It came back sounding like the exhaust was blowing. The 02+ mechanics weren’t sure. V&M’s Mellor, who knows a thing or two about winning TTs with R1s, was very sure it wasn’t that simple. There was nothing to be done with it but load it up and take it back to the workshop to find out. Popular opinion suggested a dropped valve, but in fact it was due to a " bung " that had blown out. On the standard bike there’s a pipe under the headers to feed fresh air into the motor on the over-run to ensure a clean burn and help emissions. On the racer it’s blocked off with a bolt. Amazingly, the bolt and its seat had blown free and that ruined the carburation. It couldn’t be fixed at the track. At least Mackenzie had one good blast on it. The problem with the speed – and possibly the cause of the failure – was the gearing. It was way too low. 02+ mechanic Matt Parry had never visited Bruntingthorpe before, and on a friend’s advice geared it for Snetterton. But even the monster back straight at that track is a tiddler compared with Brunters. The bike was flat-out in sixth for well over a mile, and quite simply it didn’t like it. Something had to give under the strain and the bung was it. Game over. Mackenzie said: " That’s not a bike for the novice. It’d be safe and effective in the right hands, but ride it with caution. It’s nice and smooth and the clutch has good feel so you can launch it cleanly.
" There’s acceleration everywhere as soon as you turn the throttle – the rev limiter is the only flat spot! It was pretty solid flat-out, but a little unstable at medium speeds and changing direction. The gearing was too low by about two teeth. " bikes didn’t succumb to the two toughest tests a motorcycle can face. THE Red Bull 996 is a ’99 bike updated with 2000-spec parts. While that may seem like a disadvantage, extra engine development over the winter put it on a par with the British superbike pack, including the rival INS Ducatis. While it’s based on a production model, the reality is this is a custom-built racer. 02+ R1 has a racing exhaust system, a blueprinted engine and... that’s about it. But it’s enough to up the power to around 159bhp, well up on the standard bike. V&M’S Yamaha R6 came into the British Supersport series in a blaze of publicity when Jim Moodie joined the team from Castrol Honda. The bike is similar to the stocker, but it has uprated suspension and a huge power increase thanks to a blueprinted motor, different cams and a full race system. FOR the die-hard race fan, two-strokes are what it’s all about. These are real race bikes. They aren’t based on a production model, but are custom-built. Callum Ramsay’s TZM250 may be well down on power compared to the 996, but on some tracks the lap times aren’t far off because it’s so nimble. LIKE the 250, Kenny Tibble’s RS125 is an " over-the-counter " racer. An amazing array of technology is crammed into the tiny package. There are more adjustments on this bike than most people would know what to do with, so it’s an ideal bike on which to start racing. Master this and you’ll understand anything. New MCN January 25: Kawasaki ZZR1400 flat out! Video: 2011 Suzuki GSX-R600 flat out!